Make ruined buildings livable again by spraying with clear plastic. Once a building or house hits a certain level of decay it's not salvageable with standard techniques. It simply becomes theoretically cheaper to tear it down and rebuild the exact structure from scratch, which of course never happens. The idea is to take the existing ruins as is, sweep the worst of the crap out and encase every inch in thick clear plastic sprayed on coating. This coating would do several things: arrest further decay from the elements, provide structural re- enforcement and retain the finishes and patinas of the decaying building that I feel can be very beautiful. Doors, windows and fixtures would all be removed and replaced after the shell was hardened and preserved in this manner. See attached examples and imagine these having a shiny plastic coating, being clean and new, no mildew or rotting wood smell and then having new fixtures installed. As far as fixtures, they'd all be attached to the outside of the spray on finish, no attempts being made to run cables through decaying walls and floors. The existing house would simply be a matrix to hold the thick clear plastic that would constitute the structural and load bearing elements of the construction. Do living inhabitants count as worst of the crap to be swept out or is this a sort of all purpose Pompeii treatment? I don't think I'd be super comfortable with plasticized corpses strewn around the house. Of course I've never actually tried it, but I think it would be a bit disturbing. Oh, you intend to inhabit this creation. I thought this was to produce museum pieces to edify and inspire. I understand now that you are trying to make an end run around the hassle of maintaining your own house. Have a bun! Preheated, recently released. You may not have read it yet. William Gibson " The Peripheral ". An old Airstream trailer is coated inside and out in a sprayed-on plastic coating. Wow, you mean this might actually work? Do you have a link Norm? And thank you B, always appreciated. But who would want to live in a place covered in clear plastic? All three examples you showed, are fully restorable if anyone chose to do so - in fact the last one looks inhabited and in good repair. I actually made my living in the archetectural biz in my youth and dealt with this kind of stuff quite often. These are all known as "tear-downs", structures that are so structurally compromised that it's easier to flatten and rebuild rather than repair strictly from a financial standpoint. The building we both like for instance likely has serious dry rot and termite damage in important load bearing members. Cutting these out and replacing them is no easy task. For one thing, if you're replacing a beam that holds everything up, you need to hold it up somehow while it's getting replaced else everything collapse. As far as the finish is concerned, I believe retaining the aged look once sealed and shined up might be very nice looking in some circumstances. Pretty common here in Northern California to have "distressed" antiques. That is, antiques where the age and disrepair is celebrated rather than covered up. Let me see if I can find some examples. As far as living in a plastic building, as long as it looks ok I wouldn't mind it. Ah, there's the problem. It is always going to make more sense to flatten an old structure and put up something new, efficient and dull. The point about restoring buildings is that, if nobody cares enough to actually restore them, perhaps they should just be replaced. In the UK, we tend to have the opposite problem: people are obsessed with old buildings, and anything more than a couple of centuries old tends to end up being listed and preserved. We have plenty of wonderful old buildings, but also a lot of really crap ones that nobody is allowed to replace. Just wondering if this might push something from the "Let's just let it rot" category into the "It's worth spending $100,000 to restore this mansion" category." Remember, the plastic doesn't need to be clear. 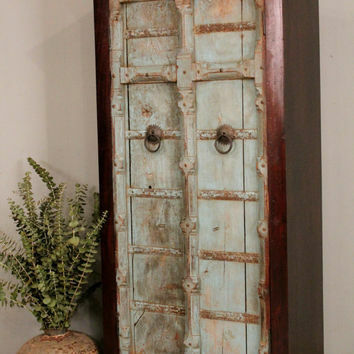 You could paint it or color it as you wish leaving some areas clear to see the distressed finishes underneath. Well, I dunno. Given that there a lot a lot of old buildings around, I'd sooner see the good ones restored and given some self-respect, and the bad ones gotten rid of. Also, as someone who lives in a reasonably old house, the only reason I like the olditude of it is that I can feel where stones have been worn down by footsteps, and touch bricks that have been grooved by ten generations of people brushing past them. And I like the feel of something - like a door or a window frame - that still works the way it was built to work back in the day. If it were all covered in plastic, there'd be no real sense in keeping it - might as well look at old houses on TV. I think you'd have to replace stuff like doors and fixtures retaining only the shell, but it's that shell rebuilding that's the most important part. But certainly it would be a weird hybrid of old and new. Would it be cool? Dunno. Might be. It really is a shame to see these beautiful old buildings crumble to dust though. 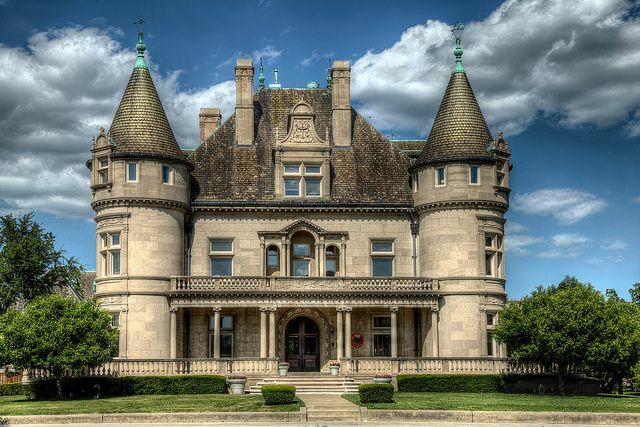 If I was a billionaire, I'd buy one of these grand old mansions that was crumbling anyway, take the doors and windows off and spray the whole thing with fiberglass reinforced plastic, the same stuff you build boats with. Then, when it was fully cured, I'd walk around the outside, the inside and see how it looked. If it looked promising, I'd say "Put doors and window up." When that was done, assuming it was still cool looking I'd say "Put fixtures and finishes in." If that looked good, I'd say "Let's go buy some old mansions and give 'em the dip treatment." If it looked crappy I'd say "Who cares, I'm a billionaire. Let's go try something else stupid. This money isn't gonna spend itself." Hmm. The thing is, the shell is usually the cheapest part to fix. As long as the walls are still upright (and, if they're not, there's nothing to preserve), it's usually just a matter of inserting damp-courses, replacing joists and roof timbers, and re-slating or re-tiling (usually using the original slates/tiles). If the plaster is beyond repair, it's not that expensive to have it re-done using period- appropriate materials (lime plaster, horsehair). What costs is things like having reproduction woodwork (panelling, doors, windows, aged oak floorboards etc) made, if the originals are beyond saving. With your plastic coating, I don't see that you're going to save much. Plus you're going to prevent the brickwork/stonework/original timers from breathing, which is usually bad news for old buildings. A plastic coat with sparkles would be great for concealing that rotting load bearing timber. Would it help with bearing load? No, the exact opposite. The expression "it's got good bones" refers to the structural elements being sound. Without the structural elements being intact there is no reason to attempt to fix the structure. I mean, think about it. What's a house? It's a frame with stuff tacked to it. Now take a house and REMOVE the frame, what do you have? You need to strip all the coverings off, drywall, shingles, tiles and replace all the frame members a few at at time while keeping the whole thing from falling down. It's a matter of practicality. It's much cheaper to just start from scratch. Much. Just look at how much less work you have to do. Rather than stripping all the stuff off, stabilizing the existing frame elements, replaceing them one by one you just build a new frame. Bricks, stones and wood don't breathe. And if for some reason they came to life and started to breathe I'd want them smothered in plastic so they'd STOP breathing. Then I'd hire an exorcist. I picture building this up in layers from the ground up. Reinforced fiberglass is pretty strong, but it's not a miracle, you'd need to do your structural calcs. Closest thing to this that exists is a restaurant in Boston that's supposedly the oldest in the U.S. Had the most amazing lobster and clam chowder ever there once. Anyway, you can see the old timbers and various parts of the building that are really just there for show, the actual modern building being built around it. The way they did it you can technically say it's the same restaurant, or inn that all those years ago hosted dinners where the founding fathers supposedly gathered to plot against the British. Anyway, here's a case where the building has such historical value that they basically just built a whole new building around it. Yes, but how often do you come across a building where the structure (bricks, stonework) is unsound? And if it is, a plastic shell is unlikely to fix it to building standards. OK, maybe the situation in the US is different from the UK. But if I take my current house as an example... When I bought it, it had only one significant structural fault: a bay window was subsiding (possibly due to root damage) and had to be underpinned - cost was, I don't know, something like £2-3000, which included the underpinning and the brickwork. Now, the interior was not in great shape - some lousy floorboards and joists; lots of plaster had blown; stuff like that. If I'd paid someone to go through the house and fix all that stuff, it would have cost maybe £30k or so for the basics, and another £30k for things like restoring/replacing oak panelling, re-running plaster covings. As it was, I paid a few thousand for plastering; as for the rest, I'm a fairly good builder/carpenter and did most of it myself over a long period - it was the only way I could afford it at the time. Brickies and plasterers are cheap; craftsmen who can repair carved panelling, make custom mouldings to match existing, etc, are expensive. //Bricks, stones and wood don't breathe.// Again, this is probably a difference between the US and the UK. Here, brickwork and timber has to be allowed to breathe (meaning that it has to be allowed to change its moisture content freely). Lime mortar gradually disintegrates if it can't breathe; and any totally enclosed timber (I mean old timber, usually oak) will eventually rot. We even have building codes that specify things like ventilation for underfloor spaces, and the use of breather membranes on new-builds. If you said you wanted to seal your house in plastic, you'd probably not be allowed to. I'm not aware of any advantage to having materials exposed to the air or elements, quite the contrary. You want to seal everything up as much as possible. I think you're referring to the fact that, yes, if you enclose a potentially damp space like an attic that's not a good thing, but coating them in plastic would render everything inert like when you see a biological specimen cast in lucite. Picture a boat, that's why they use lots of fiberglass in boats. Pretty impermeable to the water, salt and stuff. By the way, this might work for stick built structures but probably not structural stone that might be falling down. But using your house as an example, one window cost a lot of money to truss up. Imagine having to do the entire house. I just wonder what it would look like. The stuff would have to be pretty thick so you wouldn't have any sharp corners anywhere. It might have sort of a grotto or cave look. Like I said, dunno. I'd have to see it. Anyway, check the link of an example of sprayed on walls that DOESN'T exactly sell my idea from a esthetic standpoint. I'm thinking something less "cavelike". I just like ruins. I grew up next to the junk yards that we'd sneak into until the guard dogs chased us out and decay and rust just reminds me of my happy childhood. In an old building you always wonder what human stories unfolded here. If the walls could talk you know? Eh, weird thing to like I know. //You want to seal everything up as much as possible. // And, as I said, this might be a difference between the US and UK - either in materials or climate. Over here, it's both inadvisable and, in general, against building codes not to allow timber or brick structures to breathe; for new-builds, there's a moisture-permeable breather membrane. New rooves are, likewise, required to have a breather membrane under the slates/tiles; and roof spaces are required to have a certain level of ventilation. New-built boats do indeed have timber encased in fibreglass, but the timber has usually been dried to a very low moisture level, and is then completely encased to keep it that way. Old house timbers will have a fairly high moisture content, and in any case your plastic coating will probably not be complete, allowing more moisture in where it will fester. //one window cost a lot of money to truss up. Imagine having to do the entire house. // If the entire house had been subsiding, then it would probably have been condemned - no amount of plastic would have helped. I don't know, fiber glass is pretty tough stuff. Are saying the wood would somehow expand and break through the fiberglass or something? Remember, it's not important what the wood does any more, it's served it's purpose as a matrix for the foam. Well, OK. The back half of my parents' house was Elizabethan, and one room had oak beams about six-inches square by maybe 12ft long, most of them being supported only at their ends. They were recycled ship's timbers. Rather alarmingly, someone back in the 1800's had built an entire additional storey on top of this Elizabethan bit. If you think that encasing those beams in fibreglass would obviate the structural function of the wood, think again. For one thing, plastic has a very low modulus. The beams would have decayed over just a few decades, and the fibreglass would have bowed, and the upper storey walls would have cracked. If you go onto any site devoted to the preservation of old buildings, two of the main things they tell you are (a) leave stuff alone as much possible and (b) don't clad old stuff with impermeable coverings. We may not know much in the UK, but we do know old buildings. And even people like the French know this kind of thing. Let's look at a worst case theoretical. You sppay this she'll on everything then somehow remove all the house bits. Why wouldn't that work? Well, OK, but then why not just make a plastic house? 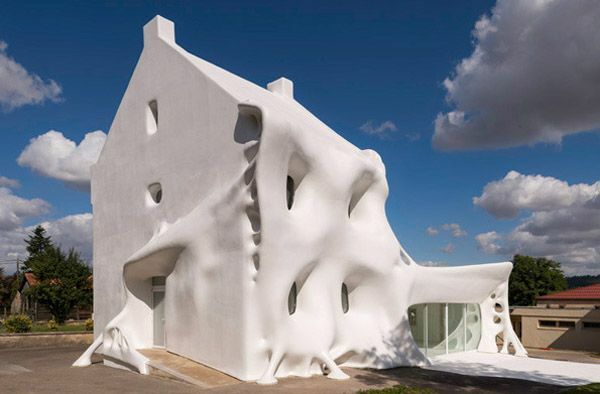 How do you make a mansion shaped plastic structure with nothing but a fiberglass gun? [Dr] look up urban exploration. As an "urbexer" I've explored and photographed many abandoned buildings - even in central london there are tens of abandoned structures hiding if you know where to look. It was particularly good during the recession where half-built skyscrapers were left unattended. However, as [Max] says, you really do want to let old structures breathe. Would this plastic spray work for boats ? What about, instead of plastic, using a combination of knitting (with wool) and origami (with paper)? While most boats are laid up fiberglass I believe they often have wood structural elements so, yea I think so. I actually used to deal with structural permeability issues when I did energy compliance reports for architects when I was a kid. The number I'd type into my old TRS-80 computer was called the "infiltration base". It referred to how much air could get through a given envelope area. You'd change it by sealing up windows and adding other elements to the walls. This breathing thing, like I said before, is probably referring to not wanting to create damp areas that mildew can grow in so if moisture seeps in, it can dry out as well. But I don't think that applies here. Just like the example of a bug cast in lucite, the old structure is rendered completely inert. Whether or not that bug needed to breathe at one time, now it's just a chunk of plastic. So would a plastic house need to "breathe"? I don't think so, and this would simply be a plastic house regardless of what was contained within that plastic in my estimation. So just think of this as a plastic house ignoring what happens to be inside that plastic just like that bug imbedded in the paper weight. It's not a bug any more, it's a hunk of plastic. Now I could be wrong, maybe the newly enclosed damp areas in the walls will foster mold growth such that it will somehow breach the fiberglass but I would be surprised. I would also think that any decay processes might be stunted or even arrested by the cutoff of air. I do concede that the structural strength of the fiberglass would have to be the same or more than the wood it's replacing since that encased wood could not be trusted to not continue its deterioration even after being sealed in, although that would slow I would think. Anyway, very cool to see that other people are into exploring crazy old ruins. There is of course the element of danger which only adds to the fun. How thick are you imagining this fiberglass coating to be? If you reinforce a 6x10 beam with 1" thick fiberglass, I'm pretty sure a 8x12 1" thick fiberglass box beam is stronger than a 6x10 solid wood beam. If you had a 1/8" thick coating in mind, it won't hold a whole lot. You probably don't need a 1" thick coat over everything, but you'll have to consult with an engineer to figure out what you actually need. You might also drill through walls at some regular spacing to insert reinforcing bits that embed in the fiberglass on both sides of the wall to prevent the wall from delaminating from the old structure. [Max] structures "breathing" is not just a UK thing. But the reason is that it is a given that you cannot completely seal something so you must allow a path for moisture to escape. The problem is that in most cases waterproof materials are not finish materials, so you always poke holes in the waterproof layer. For example on a roof you lay down felt then nail shingles through the felt. the shingles are lapped to shed water, but wind gusts can make small amounts of water go uphill. A torch down roof is more waterproof, but when you various pipes and bits poking through, there's more opportunity for small leaks. If the entire surface is coated in fiberglass (and i mean a thick structural coating), it's not going to leak unless there is a very large impact. If a tree falls on it during a rain storm, your going to have a hard time repairing this (unless maybe you take the approach that you leave it as in and coat the tree with fiberglass as a new addition to the structure). Of course adding amenities is where you'll get into trouble. All the old chimneys will be sealed with fiberglass, but if you want gas heat, you'll need a new chimney. I guess if when you drill a hole you always coat the inside of the hole with fiberglass so if you do get a leak it leaks into the house not into the wall, you might make it work. Forgot about the chimneys. Adding fire to the program would definately be an issue. Replace them with gas perhaps? Less heat and smoke to deal with. So Scad, do you think this might be an interesting experiment? Remember, to make this feasible it needs to be something with little or no prep. I'm talking about sealing the rats into the walls here. Maybe not foaming over a deal rat on the floor and leaving a rat shaped lump in the parlor, but doing very minimum prep work and just foaming every surface with inch thick or more fiberglass spray lamination. Total price for a 5,000 square foot mansion, 3 man crew plus materials, 1 week work.... $200,000. Not including fixtures that you would let the buyer put in. So you buy the mansion for, whatever, few hundred grand picking ones that the city doesn't want you to tear down rendering it worthless on the market, then spray it and sell a shell for a million bucks, or add fixtures and windows. Maybe $300,000 worth of stuff at the most and sell it for five mil. Yes? No? Possible? Insane? Hmm. Do they make fiberglass spray that's flame retardant enough to pass building codes? In the case of a house, your plastic coat will not extend underneath it, so damp will still get in. And the structure will probably be damp to begin with. Yes, but what would be the effect of that on the living area inside of the house? 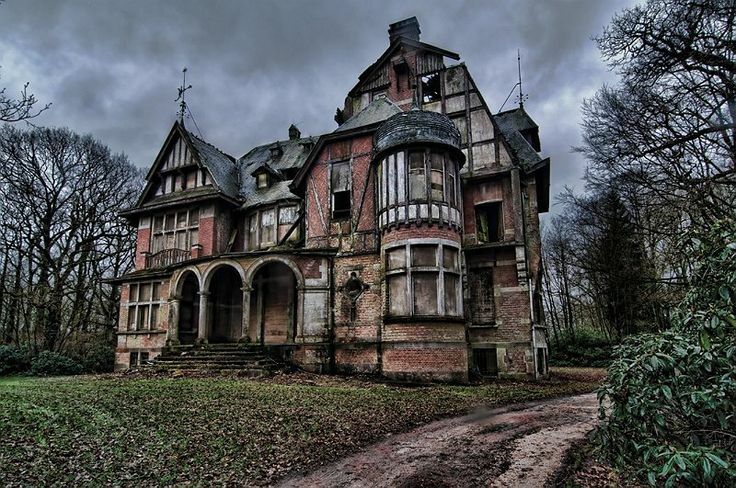 I'm thinking, correctly or not, that the house can continue its decaying, being eaten by termites etc all it wants. It's like that scorpion in the paper weight no? There's an impermeable layer between occupants and old house parts. There seems to be a difference of opinion about the permeability of chopped fiberglass and resin, the stuff we make boats with. I'm thinking it's pretty inpermeably waterproof. You're asking me like you think I know what I'm talking about. Weird. I'm not really familiar with spray on fiberglass and have only made small fiberglass patches to a boat. I've never seen fiberglass that's an inch thick that is transparent. Only translucent. How does it hold up to UV? Or are you planning to just paint he outside of the house with marine epoxy paint? I hadn't thought about the foundation. I don't think your idea of continuing decay is a good idea. If the fiberglass is transparent, the color will change and your goal of preserving it has failed. In addition we need to worry about how the foundation supports the structure. When you start, the walls of the structure are sitting on the foundation. If the wall inside the fiberglass sandwich rots away, the fiberglass probably can't hold the whole load. If you dug around the house and exposed the footing, the fiberglass could be resting on that, but the footing is designed to bear weight in the center, the corners of the footing might shear off if the weight of the house transferred there. ... Okay here's the plan. 1" holes through the foundation every 4 inches along all foundation walls and all supports. Fill holes and coat the foundation and walls with fiberglass. Once that is set, drill 1" holes every 4 inches offset by 3/4 inch from the first set. Fill those and let it cure. Continue until you have entirely separated the top and bottom of the foundation and the house is resting on fiberglass. This will be labor intensive but much less so than excavating under the entire foundation. Be sure to consult an actual structural engineer with experience in home foundations and structural fiberglass before you attempt this. I am not qualified to design this. I'm just brainstorming ideas on how it might be done. Or maybe drill the holes just above the top of the foundation so the fiberglass that you fill these holes with is resting on the foundation. Also, you'll need to plan ahead for electrical, plumbing, heating, and ventilation. Telling the buyer to install their own won't go ever well since it would be a non-standard installation and any penetration of the fiberglass could compromise the structure. Keep that in mind for window installation as well. If you're not too concerned about preserving the original torn wallpaper under the fiberglass you might just surface mount electrical conduits and piping then cover them all in your thick coating of fiberglass. Yea, you've obviously got different considerations with slab on grade vs raised floor. Not sure what most haunted houses are built on, probably raised floor. So point taken. Even if you've got a solid shell on top of that rotting floor, when that floor gives way the whole thing shifts. Starting to get more complicated but you could drill your holes through the existing floor every few inches as you've suggested, build a dam around the perimeter and pour a solid foundation that just covers the whole mess up and conforms the ground underneath the house. Then you've got your solid base to build up your fiberglassed resin with. Dumped the idea of clear plastic though. You'd just have it all be one color and then paint it as necessary. So, rip out fixtures and windows, smash the first level floors with jack hammers. (drills would take too long) Wrap your dam around the perimeter and pour your foundation material high enough to cover all that smashed floor. Break for lunch. Fiberglass spray coat everything working up from first to second floor to attic. Then spray the outside. Install all plumbing, electrical and HVAC inside tacked on soffits. Attach windows and doors and sell it for 10 times what you invested. I like the idea of adding a slab foundation to a raised floor house. The main problem with a structurally dead stick built house usually IS the foundation. And by the way, might start getting a bit thick but you could make your first outside layer foam insulation then spray your hard shell onto that afterwords. You'd lose your hard edges obviously. Might make it start to have a Dr Seuss vibe if that makes any sense. (see link) But might look interesting. /If the walls could talk you know?/ You might first need to get past your aversion to having them breathe. Oh - maybe you could use an electrolarynx to hear them talk without breathing? That would work fine.